Once again the Trust was able to join with the Homeless Children's Foundation and sponsor 12 students from the Hope for Families Center to participate in the Spring Adventure Camp in Flroida. 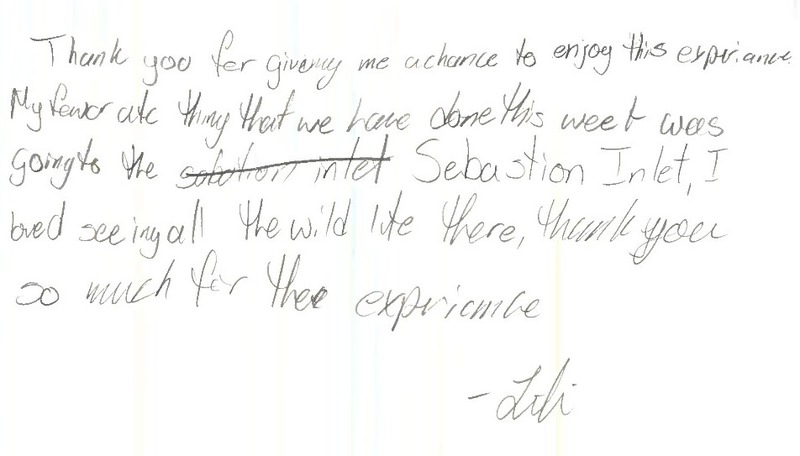 The students began the week learning how to use and care for cameras before beginning their walk on the North ORCA trail out to the observation tower, observing the different species of animal as they went. The students learned the skills of the photojournalist by recording their observations and in the process became quite good photographers! The students then had a scavenger hunt on the scrub trail, they worked in teams to find items in nature that had specific characteristics. The focus always begins with Earth Manners: being quiet, observe your surroundings, being respectful and leaving nature without a trace. This was a task that took continual reminding however, by weeks end the students showed enthusiasm and respect for themselves, others, and nature. Thanks and thanks again! Thanks sponsors! You guys are stars in my eyes. On the Tuesday the group visited Brevard Zoo, a particular treat for 11 out of the 12 students who had never visited a zoo before. They took many pictures and really enjoyed learning about the animals and where they came from. The emphasis at these Outdoor Education Classrooms is to get the students to observe, respect nature, and advocate for their local environment, while enjoying free play. Nature Deficit Disorder continues to be a concern, and Childen's Foundation is trying thier best to change this generation. They can’t ask students to love the outdoors if they aren’t familiar with it! 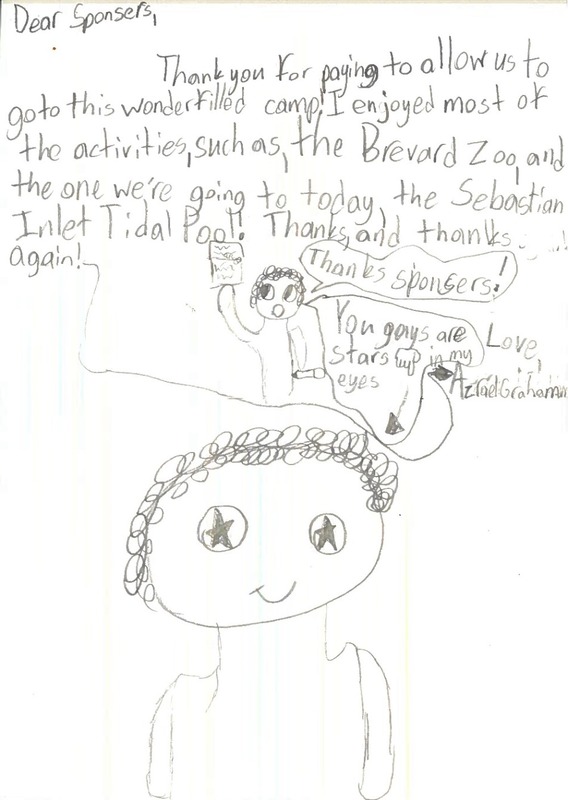 By far their favourite adventure was the trip to Sebastian Inlet tidal pool. They swam with dolphins, played on the rocks as well as taking part in some structured water games. The students ended their week, looking over their pictures while enjoying a spaghetti and meatball feast, reflecting on all that they had exprienced during a very successful camp.